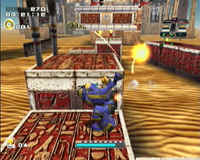 Essentially, what you get in SA2 is a blend of gameplay elements which only the greatest game developers can provide. Unlike some games, you'll be hard pressed to find at least one portion of the game that you don't find interesting. For me, the game is almost impossible to put down. The plot may not be Shakespearean, but it's far better than the usual platformer's. (INSERT NAME is being held prisoner in a INSERT LOCATION by your arch-nemesis INSERT NAME) And besides, is it not the gameplay of a platformer that matters? How many times has Bowser kidnapped Princess Peach? Exactly. In the end, SA2 creates an experience that is nothing less than a gesalt. But like every game, SA2 is not perfect. My first problem with the game is the voice acting. Sometimes, it's tolerable... But often, the lines are read with such a lack of emotion that I couldn't help becoming annoyed. Also, Sonic Team didn't take the time to synch the voices to the movement of the lips in the American track. So not only is the speech annoying, but none of the characters even look like they're speaking their lines. Switching the dialogue to Japanese seems to solve both these problems in my opinion, but the fact that the English version was not fixed is definitely problematic. Another small annoyance is the limited quantity of in-game sound bytes. In certain situations - petting a Chao repeatedly - it can become very annoying to hear your character say the same line over and over again. SA2 has some serious camera issues. While playing in either the Tails/Eggman or Knuckles/Rouge stages, you'll notice that the camera has a tendancy to get caught behind objects, under floors, over ceilings or any other places it can stick. Sometimes it takes quite a bit of moving to get it to return to the proper location. Also, it often gets stuck in a position where it makes it difficult to see where you are supposed to be jumping. And it's especially annoying, in these situations, when the game decides to not let you move the camera with the L or R buttons. In the action stages staring Sonic/Shadow, these problems are almost unnoticeable. 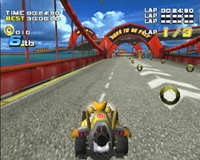 The camera sticks right behind you as you run through the level at top speed. But if you decide to find some secrets which are off the main path, then watch out, because the camera problems will likely be following you. Thirdly, I feel that the level design is much too linear. Sure, platformers are usually fairly linear by design, but there just aren't enough ways to traverse the levels. This probably won't be a problem the first time you play through the game, but after awhile you'll realize that the game's replay value has been stunted by this fact. Luckily the Knuckles/Rouge levels have plenty of hidden areas and are open to exploration which will keep you busy for quite awhile. (Pumpkin Hill is massive) But I can't help but wish that Sonic Team would have followed suit with the rest. The fourth and final beef is just that SA2 just won't suit everyone. There are still plenty of people who dislike the 3D platformer and this game isn't going to change their minds. The game isn't innovative. In fact, pretty much everything you'll see here was in the first game. What it does do well is refine those older gameplay elements. I've heard a number of complaints from people who claim that any one of the three different gameplay styles doesn't suit them. And if that's the case, then a whole third of the game is going to annoy you. So, just keep that in mind before purchasing the game. Highs: Classic gameplay, jaw-dropping visuals, extremely polished presentation, great multiplayer. Lows: Some of the voice acting, some bad camera problems, linear level design.